According to Cooking Light, this SHOULD have been a super quick dish. However, in my kitchen, nothing is what it SHOULD be. In my kitchen, as in my life, it just is what it is. Which is usually me making things harder than they really have to be just because I’m stubborn like that. And what this is, is a pretty easy chicken in wine sauce. It won’t necessarily knock your socks off. But it won’t require you to spend hours preparing it either. It’s a trade off I can live with. 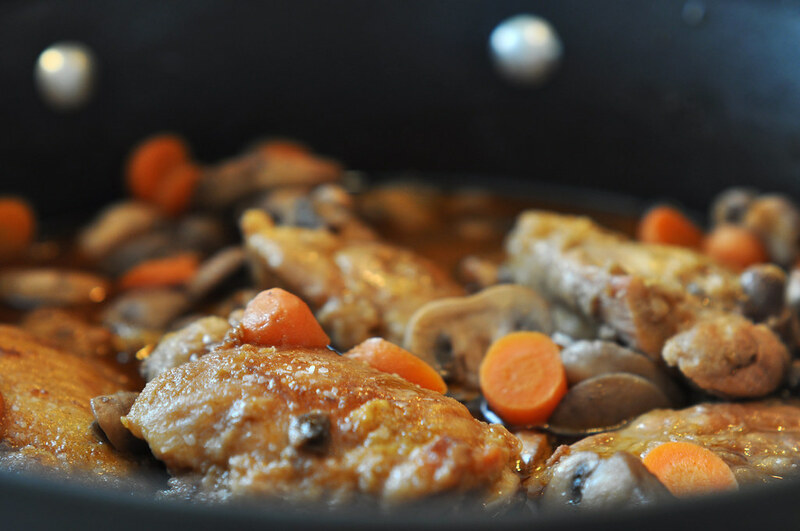 I’ve got another “quick” coq au vin recipe lurking in my folders. I’ve held off making it for two reasons. First, this Cooking Light recipe has been in my stack for a few years and needed to go first. Second, the other recipe is from ATK and the very last issue of CI that I received after our breakup. I’m still a little bitter and don’t think I’m totally ready to make up with them yet. But like cutting off my nose to spite my face, I could be missing out on a better version of this dish because I can’t get past the bitter taste they left in my mouth. Life is too short, and there’s too much food to be experienced to be angry and bitter. But does liking their recipes (especially when I don’t want to) and buying their product make me a hypocrite of the first order? I’m going to have to think about that. In the meantime, I’ve got some Not So Quick Coq au Vin to dine on. BAH Note: One reason my Coq au Vin was not so quick is because I was using bone in thighs which take longer to cook than boneless. Using boneless will certainly cut down on the cooking time but I really prefer using bone in thighs. I also thought the au Vin needed more Vin. So once I was satisfied that the chicken was cooked through, I removed it from the pan, added more wine and then reduced the sauce to make it a bit richer and concentrate the flavors. I probably added about 45 minutes to Cooking Light’s recipe but most of it did not require me to be standing guard at the stove. Combine the flour, dried thyme, and 1/2 teaspoon kosher salt in a plastic bag, add the chicken, and shake to coat. Heat the olive oil in a dutch oven over medium heat. Shake the excess flour from the chicken and add it to pan. Work in batches, to avoid steaming the chicken, if you need to. Cook for 10 minutes or until browned on both sides. Remove the chicken from the pan and cover to keep warm. Add the mushrooms, carrot, and Canadian bacon to the pan and cook for two minutes. Stir in the chicken broth, 1 cup of wine, and tomato paste. Cook for ten minutes. Return the chicken to the pan and simmer for approximately 15 minutes or until the chicken is done. If using bone in thighs, this could be more like 20 to 30 minutes. Taste the sauce, adding kosher salt to taste. The chicken and sauce can be served at this point. To make the sauce a bit richer and fuller, remove the chicken and cover to keep warm. Add 1 to 1 1/2 cups more red wine to the pan and cook over high flame to reduce by half. Return the chicken to the sauce to warm back through and serve. Any girl who adds more vin is a girl after my own heart! Kitch, the bottle was already opened so why the heck not? I always think cooking light recipes with vin need a bit more at the end. but that could be because they sacrifice on wine to save calories, which also sacrifices taste. Agreed Beth, it’s a trade off. Less wine = less calories = less flavor. So I’m not at all adverse to turning up the vin. I thought this dish had pretty good flavor. I’ve got one or two more coq au vin recipes sitting in the folder that I want to try. If I could clone myself, I’d do battle CoV! I made a great variation on coq au vin–“rigatoni with braised chicken and saffron cream.” It was just unbelievably delicious! Oishii! Your rigatoni with braised chicken looks like something I would really enjoy. I’m putting that and the moroccan style stuffed squash on my list of things to try.